It’s an intriguing little game, though fundamentally quite straightforward. How good you are probably depends entirely on how much patience you have planning ahead without getting confused by the “move your piece based on the arrows under your opponent’s piece” rule. The patience of your opponent waiting for you to make your move probably has an affect as well. With only an eight-by-eight grid to work on, you often find yourself going round in circles trying to find an opening that gets you over the finish line. A good memory and being unconcerned by feelings of deja vu are probably pre-requisites to play. 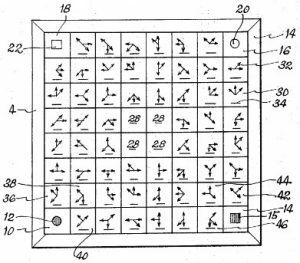 The US Patent Office found similar ideas for games going back as far as 1894 in US Patent 519326. 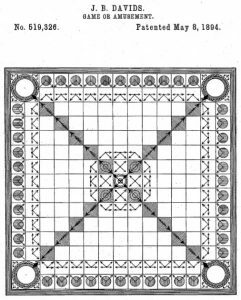 The name of this game is lost to history, if it was ever produced at all, and requires a giant board of 15×15 squares. Players drive their pieces to the centre to do battle and then run the gauntlet to reach their opponent’s corner. The creator tries hard to make it sound exciting! 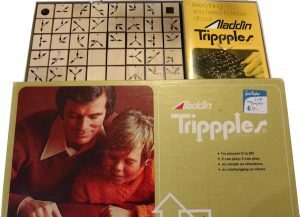 One special thing about Trippples, mentioned in the claims of the patent, is that every tile has a different set of three arrows – “directional indicia” in patent speak. This made it a good opportunity to refresh my rusty knowledge of combinations and permutations. I find this sort of thing exciting even if 99% of the world doesn’t! According to Wikipedia, combinations are where you have “n” things and take “k” at a time without repetition. The number of different combinations is given by n! / (k! * (n-k)!). In Tripples, n=8 since there are 8 directions any arrow can point. k=3, since there are three arrows on every tile. So, the number of combinations is 8!/(3! * 5!) = 40,320 / (6 * 120) = 56. Tripples should have 56 different tiles. The Tripples board is the same as a chessboard – 8×8 making up 64 squares in total. The 4 corner squares are the start and destination points for each player, so that brings us down to 60 squares. To get to 56 arrow tiles, 4 of those 60 squares are filled with blank tiles. In the game, blank tiles are either neutral zones that players can’t enter, or are bonus spaces that allow a player to make a second move. To be honest, the game manual is a bit hazy about what to do with the 4 blank tiles. I can’t help feeling the inventor, a researcher of psycho-cybernetics with the amazing name of William T. Powers, was a bit upset that the realities of mathematics messed up the perfection of his game! The inventor was this William “Bill” Powers, who sadly passed away in 2013, so now we can never be sure.